From Washington... Take Rt. 495 to Rt. 4. Take Rt. 4 south 15 miles, then take right onto Rt. 258 (Bristol/Deale). Follow Rt. 258 for 5 miles to first stop light. At the stop light make a right onto Rt. 2. Proceed 1/4 mile and take first left onto Rt.256. Follow Rt. 256 for 2 1/4 miles to Dockside Restaurant & Bar. 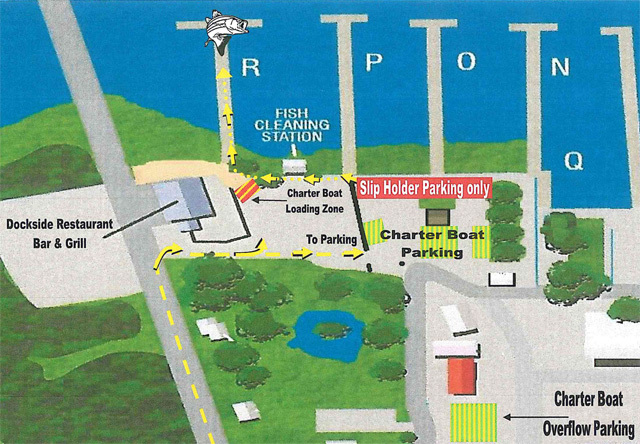 Turn right immediately before the restaurant and follow the signs to "Charter Boat Parking." From Baltimore... Take Rt. 695 to Rt. 97 South. Take Rt. 97 South 18 miles (Rt. 97 will merge with RT. 665 Aris T. Allen Blvd. to Rt. 2 South 16 miles and take left on Rt. 256. Follow Rt. 256 for 2 1/4 miles to Dockside Restaurant & Bar. Turn right immediately before the restaurant and follow the signs to "Charter Boat Parking." From Annapolis... Take Rt. 2 South 16 miles and take left on Rt. 256. Follow Rt. 256 for 2 1/4 miles to Dockside Restaurant & Bar. 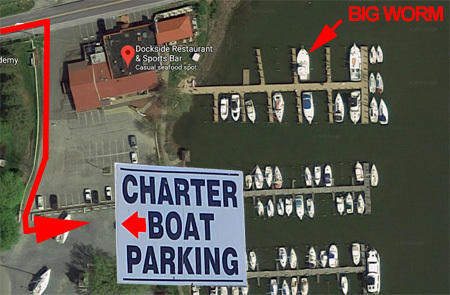 Turn right immediately before the restaurant and follow the signs to "Charter Boat Parking."